Researchers at the MRC WIMM Centre for Computational Biology have developed a user-friendly platform to visualise chromosomal conformations in 3D, with potential virtual reality applications. DNA folding plays a crucial role in bringing together genes and their switches, and therefore in gene regulation. Researchers have developed a range of chromosomal conformation capture techniques to understand this folding including 3C, 4C, 5C, Hi-C, Capture C and, more recently, Tri-C. But the data from these techniques is usually visualised in 2D genome maps or heat maps, while chromatin has a 3D conformation, making it harder to visualise the intricacies of its structure. To overcome this limitation, in collaboration with colleagues at Goldsmiths, University of London, Steve Taylor and his team at the MRC WIMM Centre for Computational Biology developed CSynth, a 3D genome browser and real-time modeller. 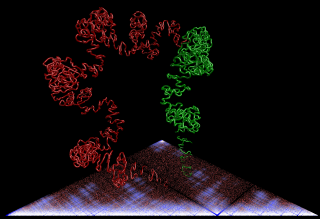 CSynth is able to create dynamic and interactive 3D models using chromatin capture data. Importantly, and unlike other modelling approaches such as physics simulation, it has short processing times. The programme also offers a variety of additional features that can be useful to researchers exploring this type of data: it is possible to annotate and colour the models, or to place markers to monitor distances or other features. These tools are particularly useful when comparing the same locus in different conditions (e.g. at different stages of development, or in disease states). Another important feature is the ability to easily access the original 2D heat map in parallel with the 3D generated model. The programme also allows for dynamic modelling of some of the physical forces at play. In their research manuscript published today in Bioarxiv, Steve and his team provide a few examples of the potential applications of this software. 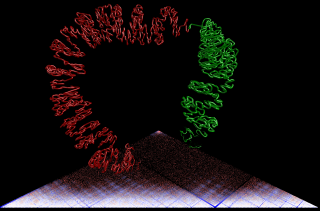 This include their work on the conformational changes of the haemoglobin locus, done in collaboration with researchers at the MRC Molecular Haematology Unit (the project that originally instigated the development of this technique). Another example tracks chromosome 1 of the yeast S.pombe and its conformational changes as the cells transition from mitosis into interphase, a project carried out in collaboration with colleagues at the Francis Crick Institute in London. But one of the key features of CSynth that it can be easily used to examine any type of chromatin capture data. The programme is designed to be user friendly, and to work with most types of capture data available: data can be uploaded and visualised using a standard web browser. An exciting feature of CSynth is its ‘VR’ mode, which allows the models and the programme’s interactive features to be uploaded to virtual reality equipment. This allows researchers to explore and examine their data in an immersive and highly interactive virtual reality experience, making the identification of new features easier. An additional bonus of this feature is its potential to engage the public with concepts that can be hard to describe, but which are easy to see in 3D. 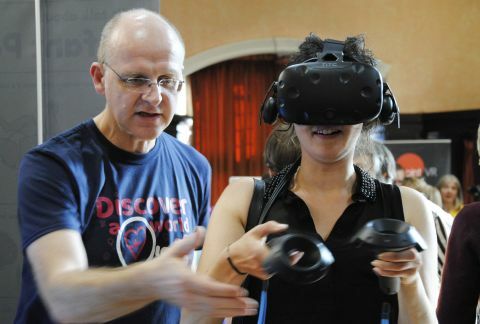 The team has already taken their virtual reality experience to a variety of science festivals, including the Royal Society Summer Exhibition and Cheltenham Science Festival. The CSynth platform also allows for models to be published online, so that they can be shared and used for engagement across institutes.